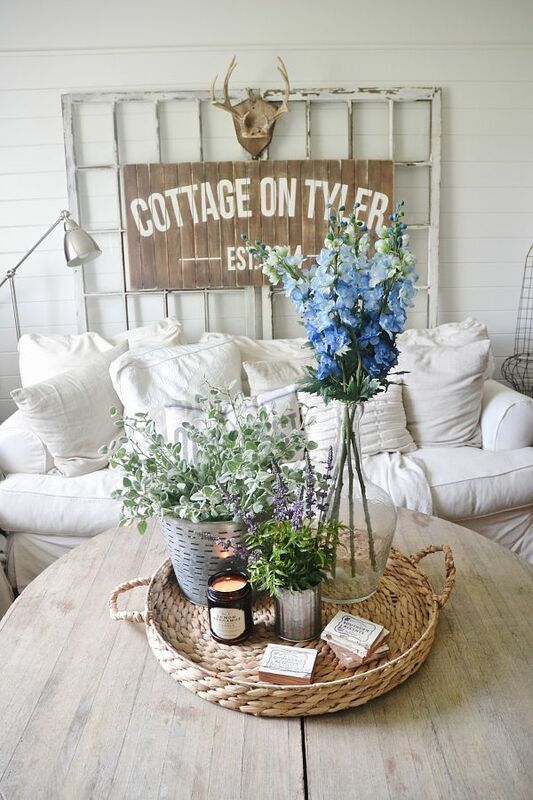 All kinds of simple and inexpensive summer decorating ideas to bring that easy breezy feeling indoors. How is your summer going? I can’t believe it’s mid-July already. With renovations happening in full force around here, I sometimes forget which season we’re in- ugh! I think I’ve finally decided on all of the finishes and have most of my ducks in a row (hopefully). Perhaps, now, I can begin to enjoy a bit of warm-weather downtime (before it’s gone!). One thing I haven’t done much of this summer is decorating. Usually I change out our decorative pillows, brighten up our bedding and bring in some light and airy accessories. But, drywall dust is still an issue around here, so I’ve decided to keep it down to bare bones. If your home isn’t ripped apart like ours, I say take advantage of the great sales that are going on right now. Summer is far from over and there are so many ways, big and small, to bring that easy-breezy feeling indoors. 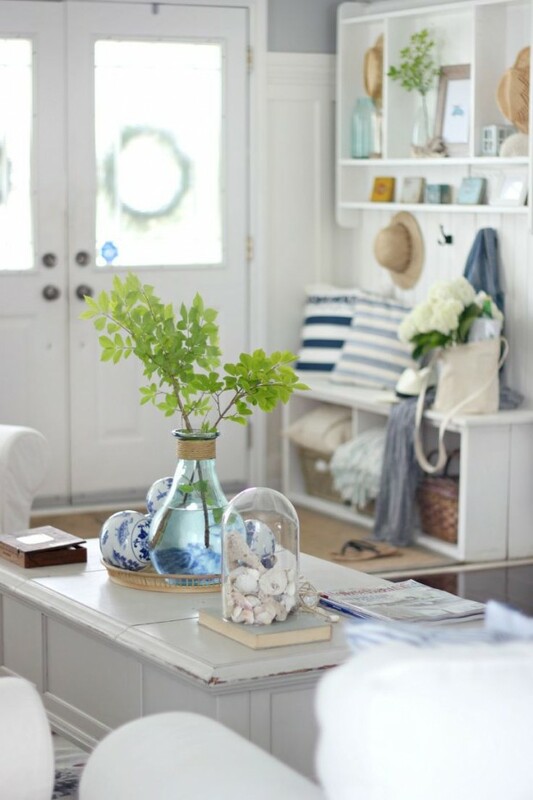 Please pin these lovely summer decorating ideas from the original source. 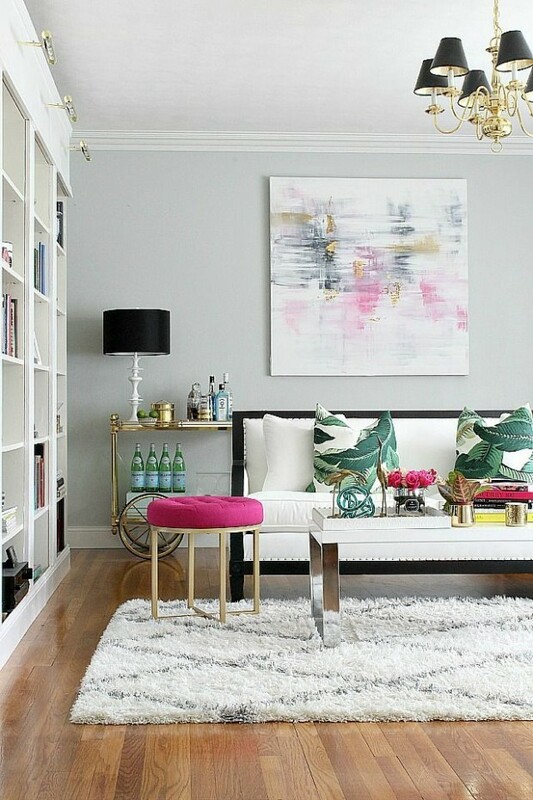 Update your space with a refreshing colour palette. So many of us have neutral spaces that crave the injection of lively colours, such as pink, lemony-yellow and sea green this time of year. If you want to play it safe, incorporate colour with inexpensive pillow covers, vases, candle holders, storage boxes, lamp shades and simple framed art. 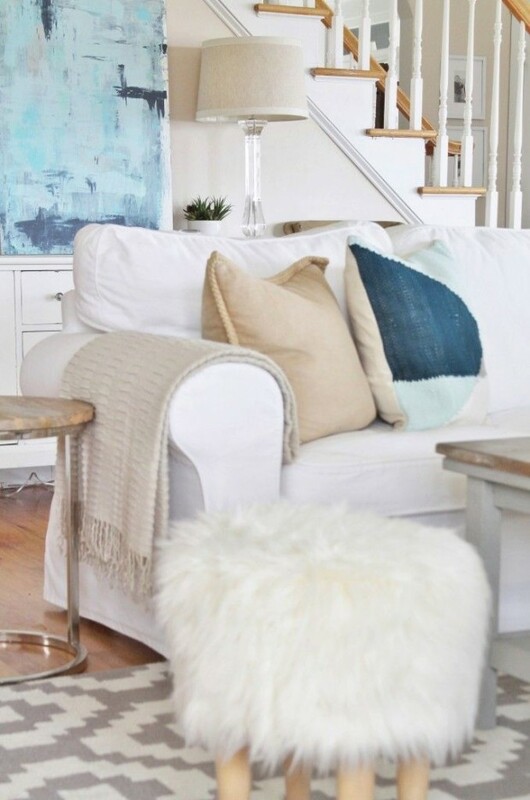 Use whites and watery blues to bring a sense of cool to areas of your home that get too warm. If you’re more daring, try painting a wall or two in something bright and cheery. Slipcovers are a great way to lighten up dark upholstery during the summer months. Choose fabrics like twill or denim that can be easily washed and are cooler to the touch. White, light grey and tan are the best choices for larger pieces, but also consider covering an armchair with a colorful summery print for added interest and fun. In addition, replace heavy or dark drapery with lightweight fabrics or woven blinds. Finally, replace heavy area rugs with sisal or cotton or simply opt for bare floors. Summer is known as a “put your feet up and drink a glass of lemonade” kind of time. Create a casual feel with fuss-free materials such as reclaimed wood, seagrass, linen, and recycled glass. There’s no better way to take in summer than fresh flowers. 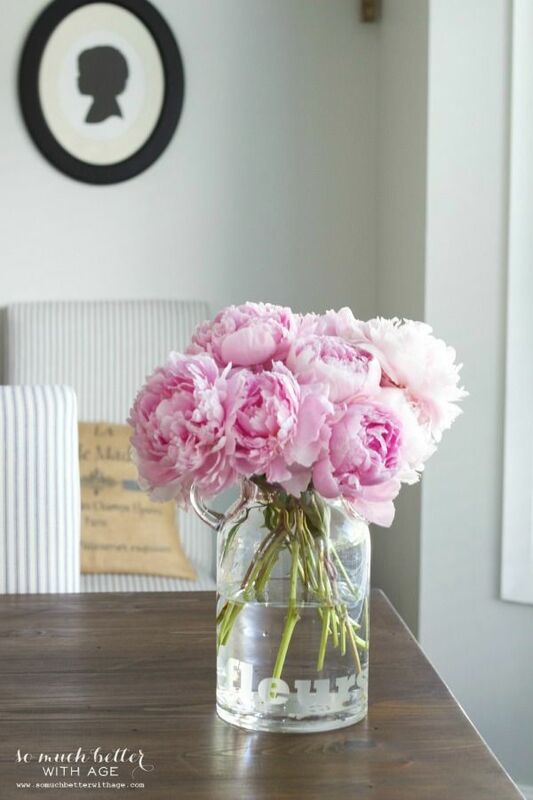 For an instant mood lifter, place a large vase filled with colourful and fragrant seasonal cuttings, such as peonies, lilies or hydrangeas near your front door. In addition, replace tired looking plants with healthy vibrant ones like succulents. Create a feeling of breathing space by going through stacks, piles and collections of stuff and pass along those items you no longer use or love. Corral essential items in woven baskets or painted wooden trays. Re-arrange furniture to give a better sense of flow to your space. There probably isn’t a summer that has gone by without creating some sort of fond memory. Surround yourself with items that take you back to these moments, such as the camping trip you went on with friends or the first time you caught a fish. 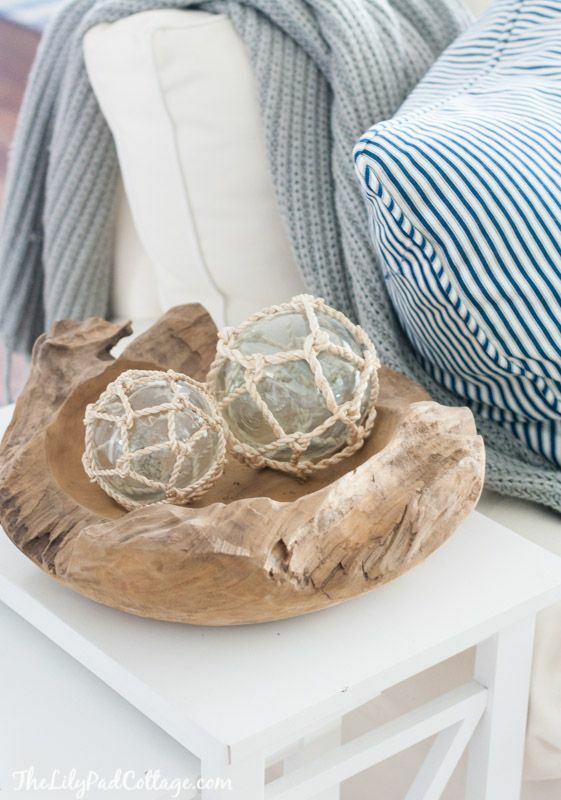 Pictures, maps, shells, rocks and driftwood not only add a beautiful decorative element, but symbolize happy times of the past, acting as an instant pick-me-up after a long day. Whether you choose to incorporate many of the summer decorating ideas or only a few, remember that your home should always be a reflection of you and your family. Only choose the suggestions that speak to you to ensure that your home is a place that truly nourishes your soul. I so hear you Shauna, on the summer zipping by! I think for both of us it will be rewarding in the end because of why we are seeing the weeks come and go in a blink. I loved this post and feel so inspired by it – I just want to get to the fun stuff in our new abode! Thanks for this timely post!! I spent more time outside this past weekend, and it was great. A little work, but nothing like the staining I did earlier this month. That made me wish summer was over! Absolutely adore the subtle color accents. Brings the kind of freshness you expect from summer! Thanks for the lovely post.